When Michael Scheuer first questioned the goals of the Iraq War in his 2004 bestseller Imperial Hubris, policymakers and ordinary citizens alike stood up and took notice. 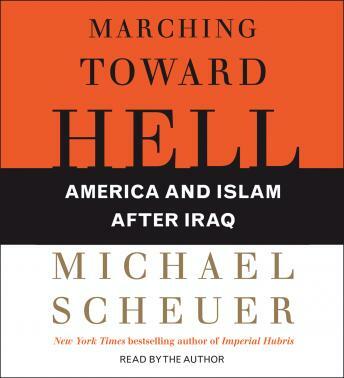 Now, Scheuer offers a scathing and frightening look at how the Iraq War has been a huge setback to America's War on Terror, making our enemy stronger and altering the geopolitical landscape in ways that are profoundly harmful to U.S. interests and security concerns. Marching Toward Hell is not just another attack on the Bush administration. Rather, it sounds a critical alarm that must be heard in order to preserve the nation's security. Scheuer outlines the ways that America's foreign policy since the end of the Cold War has undermined the very goals for which we are fighting and played right into bin Laden's hands. The ongoing instability in Iraq, for example, has provided al Qaeda and its allies with the one thing they want most: a safe haven from which to launch operations across borders into countries that were previously difficult for them to reach. With U.S. forces and resources spread thinner every day, the war has depleted our strength and brought al Qaeda a kind of success that it could not have achieved on its own. A twenty-plus-year CIA veteran, Scheuer headed the agency's Osama bin Laden unit, managed its covert-action operations, and authored its rendition program. Scheuer spent his career developing strategies to keep America safe, by any means deemed necessary by the presidents he served. It was his job to take available intelligence and devise plans to protect Americans, without considering bias, position, or even existing alliances. In Marching Toward Hell, Scheuer takes on the questions of 'What went wrong?' and 'How can we fix this?' and proposes a plan to cauterize the damage that has already been done and get American strategy back on track. He lists a number of painful recommendations for how we must shift our ideological, military, and political views in order to survive, even if that means disagreeing with Israeli policy or launching more brutal campaigns against terrorists. America holds its destiny in its hands, Scheuer says, yet not nearly enough has been done to defend America and destroy its Islamist enemies. This is an eye- opening, alarming, contentious, and ultimately fascinating examination of how far off track the War on Terror has gone, and a critical read in understanding what we must do to save it.